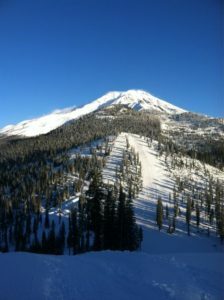 Over the past 250,000 years a series of eruptive episodes led to the formation of majestic Mount Shasta, at 14,162 feet, one of the tallest mountains in the United States and visible from over 100 miles away. Around and down the mountainside is a vast wilderness area with trails, streams, hot springs and vistas offering amazing long range views. 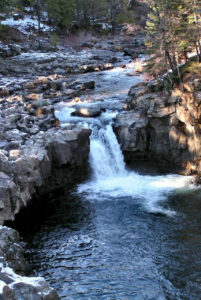 Snowfall on the mountain melts and forms the headwaters of the McCloud River, one of the most famous trout streams in the world with its three beautiful waterfalls, a must see when visiting McCloud. 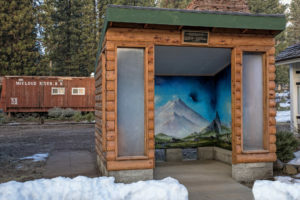 At just over 3,000 feet in elevation, the town of McCloud, California is surrounded by large stands of Ponderosa pine, Douglas fir, incense cedar and other coniferous trees. These forests provided timber for the McCloud River Lumber Company, the original owner of the lumber mill. 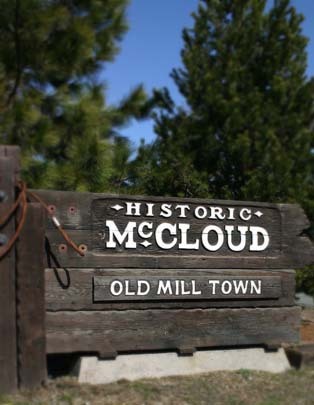 The Lumber Company owned the entire town of McCloud including the McCloud Hotel which was built in 1916. Nowadays the lumber mill is quiet and the buildings on Main Street are shops, galleries, restaurants and a museum. Outdoor recreation is unlimited. During winter there is both downhill and Nordic skiing, snowshoeing and dog-sledding. Trout season opens in the spring along with hiking, kayaking and whitewater rafting on the area’s larger rivers. Through the summer there are high mountain meadows filled with colorful wildflowers while the looming presence of Mount Shasta is an inspiration for contemplation and spiritual awareness all year long. Beginning with the Mushroom Faire in late May and finishing with a month long celebration of Victorian Christmas every weekend in December, a series of town festivals through the year offer fun things to do while visiting McCloud. During many of the festivals, Historic Main Street is closed off to automobile traffic so local crafts, foods, music and artwork are setup on the street. Just nine miles off of Interstate 5, McCloud, CA is a hidden, historic treasure. Visit us!